This is a follow up post to this entry here (K-TAI 2009). 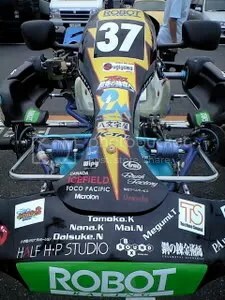 On August 2nd, 2009, several voice actors and anime staff participated in an annual Go-Kart race known as K-TAI. Among those voice actors was Mizuki Nana, who was part of team known as Team Eternal Diva. 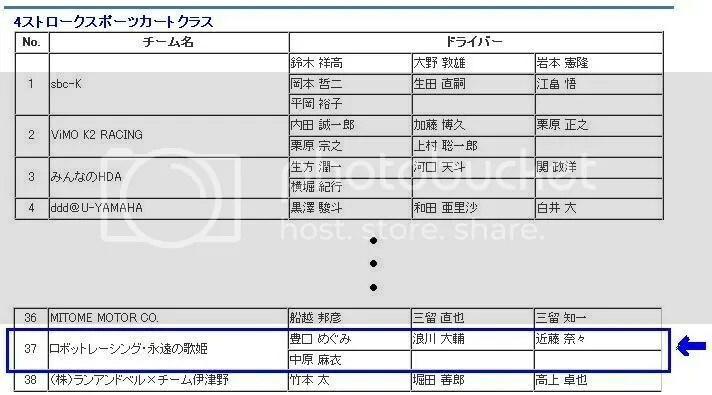 The other 3 drivers of her team include: Nakahara Mai, Namikawa Daisuke, and Toyoguchi Megumi. ^K-TAI Entry list. The highlighted part, Team 37, is Team Eternal Diva. But things aren’t so simple. At the time when the decision was made, no one could’ve imagined that Team Eternal Diva would get a Pole Position Start. Needless to say, Nana-san was nervous and doubtful of her abilities. In official races, those who get a PP Start are racers with a lot of speed. So it’s not all that dangerous. HOWEVER. Robot Racing Teams are built more upon enjoyment than need to win (even if fellow team #25 Team Pikachu won 3rd place). Which means, of course, that it was a dangerous start. With a total of 120 karts in the race, Nana-san was to be in the lead for one lap (following the safety car) until they reach the START line — when the race officially starts. I didn’t notice this until Nana-san talked about it on Smile-Gang, but apparently, she slowed down right when the race started. Re-watching the Mizuki Nana K-TAI 2009 PP Start, I realized it was true! (Thanks to my dad who pointed out that “How in the world can the car behind her accelerate THAT much?” when he saw me studying the video. XD) The car behind her didn’t accelerate THAT much (even though there’s no doubt the car behind her was faster), rather, it was Nana-san who slowed down! The reason? As everyone neared the START line, Nana-san suddenly noticed that the signal was still red, meaning the race hasn’t started yet. Confused and unsure what to do, she loosened up on the gas pedal, but as soon as she did that, the signal turned blue (Go!). XD (Despite that, I think she waved when the race began? For sure she made a hand motion, as can be seen the PP Start video). ^The North Short Course on which our beloved voice actors raced on. Not much went wrong for the first hour and a half. Everyone safely did their half hour drive safely. But on Megumi-san’s 9th lap (she was the 4th driver), it began to rain. Due to the extremely hot temperature (along with the racing suits they were all wearing), the rain was happily welcomed. It cooled down the area by quite a bit. Nana-san commented that she was able to enjoy herself more this year than last year because she didn’t feel like she was about to faint from the heat. But although precipitation was welcomed, there was a problem. The tires on the kart were dry tires. It’s very easy to slip and lose control in the rain, so tire change is required. Megumi-san signaled (known as the embarassing “Tehe!” motion) to the crew that she’ll end her turn soon (which was coming to an end anyway as she already did 9 laps) and return to the pit for tire change. 9th lap. She only had one more lap to go before returning to pit. Yet that was when it happened. She made a turn. And the kart spun. But thankfully, she was all right. But the road was too slippery and it led to a ‘course out’. For the first time since Megumi-san started racing, she raised her hand (I’m assuming it’s some sort of signal to alert others that she can’t bring the kart back on course?). Whether it was good timing or bad timing, the Safety Car (SC) made its appearance then. When the SC is on the course, all karts must maintain their speed and position. So if the SC had arrived earlier, Megumi-san might not have met the same fate. During the time the SC is out, the Rescue Team made their way to Megumi-san. They got her kart out and put her back on the course but… Megumi-san still had to drive herself back to the pit. Which means… There are corners awaiting her arrival. Going by order, since Megumi-san’s turn just ended, it was Nana-san up next. However… Nana-san has no experience with driving in the rain… It’d be way too dangerous to send her out. Megumi-san, on the other hand, has quite a bit of experience (provided she has rain tires equipped). But seeing what had happened, asking her to race for another half hour was not an option. This left Nakahara Mai and Namikawa Daisuke. K-TAI 2009 is Mai-san’s first race ever, so, much like Nana-san, she has no experience in the rain either. So the only choice is Namikawa Daisuke. After putting on rain tires, Daisuke-san heads out. The team was called down to see the officials. She apparently pulled off a dangerous move at some point, leading to the team being deducted 2 points. ^How Team Eternal Diva Kart and Team Rocket Kart looked like respectively. At any rate, after Megumi-san parked the kart in its rightful place, she hugged Paku-san and they both began crying (well, in Megumi-san’s case, she was already crying before she got off the kart XD). Apparently, this is the first time Paku-san has participated in K-TAI, and… due to her busy schedule, she wasn’t able to practice all that much. Megumi-san wrote that she must’ve been insecure the whole time. Megumi-san first met up with the pit crew (who had been waiting for her at the course exit). They praised her on a job well done (which caused her to break into tears again). It was because of these members that the drivers were able to drive with confidence. But Megu-san was slightly disappointed that the others didn’t come out to meet her. Deciding to go see the others, she suddenly realized Paku-san wasn’t there with her anymore. Wondering if she went ahead without her, Paku-san rushed by her. Making sense of the situation, Megumi-san concluded that Paku-san must’ve wanted to see everyone else as much as she did that that she began running towards the pit area. Following her example, Megu-san sprinted towards where everyone was waiting. As she was running… The majority of the people began running away. Her reaction was hilarious. I’m finally back but everyone seem to be running off elsewhere. Does everyone want to go to the closing ceremony that badly? As soon as Megu-san entered the pit area though, waiting for her were the crying figures of Nana-san and Mai-san. 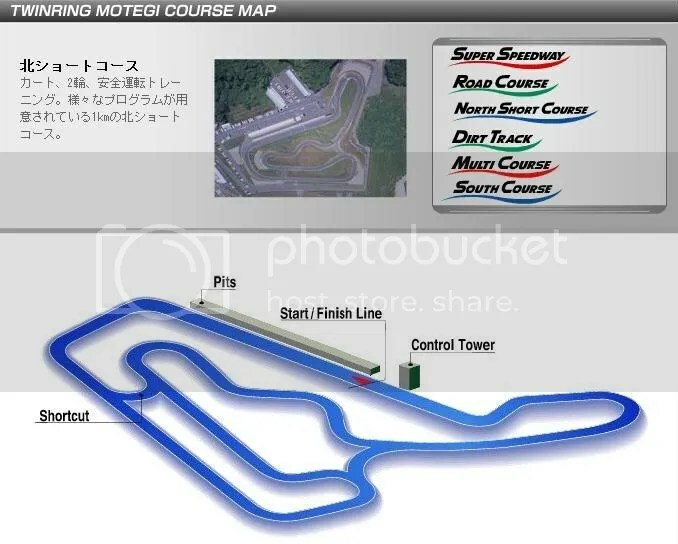 Yes, the reason for Paku-san disappearing, rushing to the pit area, and then everyone running off somewhere when Megu-san arrived was because Kart #63 (Team Rocket’s Kart – the one Paku-san drove) was on fire. It was safely put out though and everyone went to attend the closing ceremony. And so… that was K-TAI 2009 for our voice actors and anime staff. Everyone crossed the finish line and came back safely. Happily. よくがんばったね、みんな！あたしも感動しました！Looking forward to next year! The majority of information are taken from Toyoguchi Megumi’s blog and Mizuki Nana Smile-Gang 384. 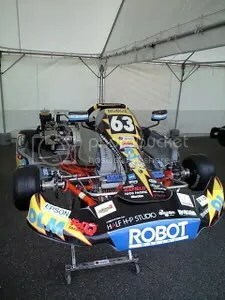 Tho i doesn’t know what to say about the race XDDD, i love driving karts but i’ve never done a very long race; looks very fun ! XDDDDDDDD The part about people running away the Megumi-san made me laugh LOL. Yeah, it was after she came out. Around the time when Megumi-san met up with the pit crew, a driver from another team went up to Paku Romi and told her that there was smoke coming from her car. Paku Romi immediately made a mad dash to inform everyone else. All the guys who were present (except for the camera person who took a certain picture XD) went out and (successfully?) saved Team Rocket’s car.